This tutorial explains how to perform comment in react js application. React uses JSX, it is a XML-like syntax extension to ECMAScript without any defined semantics. It's NOT intended to be implemented by engines or browsers. 3. You can't just use HTML comments inside of JSX because the compiler will think that they are real DOM Nodes. React developers has stated they do not plan to add regular JS commenting to JSX. 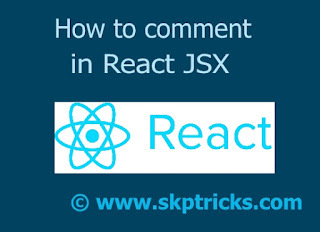 This is simple example for React JS comment block, depending upon you requirement do specify comment block in you script.